"Rashtrapati Bhavan: From Raj to Swaraj": This is a book for children which recreates the story of Rashtrapati Bhavan from its inception as Government House, a symbol of imperial might, to the present day. According to a statement issued by Rashtrapati Bhavan, the reader is taken to the massive building, through the red sandstone and marble corridors, past the busts of former presidents; through its echoing halls and its elegant sitting rooms. The reader is introduced to the flower-lined pathways of the magnificent Mughal Gardens and to its walls and pillars, trees and bushes, carvings and paintings. 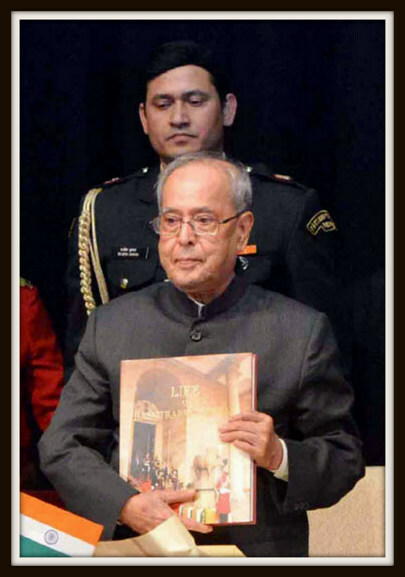 "Life at Rashtrapati Bhavan": This book is an attempt to record the human history of the residents living in the President’s Estate. This documents the period under the colonial state right up to the current presidency and brings in the perspectives of past and present residents of the estate, the permanent staff of the household and secretariat, as well as the officials who have served under different presidencies. The book also documents the significance of the multiple contributions made by President Pranab Mukherjee and his team in transforming the premises of the Rashtrapati Bhavan into the ‘smart’ city that it is today, and the impact of such changes on the lives of the people here, the official statement explains. "Indradhanush Volume-II": This is a compendium of music, dance, theatre and cinematic presentations organized at Rashtrapati Bhavan from mid 2014 to September 2016.